Our usual Jungle Red Chat is being postponed until Wednesday. Today, we're talking instead with one of our favorite writers, Marcus Sakey. The first thing you have to say when writing about Marcus Sakey is OH MY GOD HIS HAIR. Marcus is widely acknowledged to be one of the three best-tressed writers working in America today. Readers, it is even better in person than it appears in carefully composed author photographs. I have personally seen women unable to resist walking up to him at writers' conferences and touching The Hair. The second thing you have to say when writing about Marcus Sakey is OH MY GOD HIS WORK. Marcus exploded onto the crime-fiction scene in 2007 with The Blade Itself, a strikingly original treatment of a classical film-noir premise: a crook who has painfully straightened out his life is unwillingly forced back into crime. I find a deeply cinematic quality to all Marcus's books. Not, I hasten to add, because they read as if he dashed them off on the way to the option meeting in LA. They're cinematic in the depth of his feeling for place and setting, and in his tight focus on the one, or two, or four people who make the story. He has a director's eye for picking exactly the right moment to show us; no more, no less. It's unsurprising that his first book has been optioned by Ben Affleck and his third, Good People, is in production with Tobey Maguire starring and the director of The Girl With the Dragon Tattoo at the helm. Marcus writes stand-alones (increasingly a rarity in today's series-centric crime fiction world,) but there are similarities to all his novels. They all have detailed, utterly real characters at the center of the story. His heroes and heroines are ordinary people who find themselves - though mischance or bad decisions – in deep trouble. Things are going to get a lot worse before they get any better. And you, the reader, will be staying up until 2am because you can't put the book down. Today, he talks with us about movies, mace, and what Chicago Magazine calls his “ingeniously concocted” new novel, The Two Deaths of Daniel Hayes. JULIA: Lee Child has described your upcoming book as "What if Dennis Lehane wrote a Harlan Coben story?" Why do you consider The Two Deaths of Daniel Hayes your most ambitious work - which is saying a lot in your case. MARCUS: First of all, thanks for having me. And after this kind of treatment, I've decided I'm not leaving. Lee is an incredible guy. Talk about the very model of grace and class--the man has sold 40 million copies, and yet he's willing to take the time to write not just a blurb, but a full-page letter of support. The new book was a monster. Every time you sit down to start a novel, you have an idea of what you hope it might become; this shimmering, magical thing, all the more perfect because it's unrealized. But then you start to put words to it, to snarl the plot and mess with your characters and develop your themes, and that's where the real effort comes in. And the more you cared about your original vision, the tougher things are, because no book is ever as perfect as you hoped it might be. So I had a hard road on this one. Among other things, that means I threw out about 200 pages, which let me tell you, is not a fun thing to do. That said, I'm wildly glad I did. I love this book, and it seems like others do too. JULIA: I understand that the Marcus Sakey media empire is expanding, and that you are involved with a TV show. Is it true there may be live footage of you being pepper-sprayed up-close and personal? MARCUS: Yeah, it's a bit unexpected, but I'm really excited about it. I've been working with a production company to develop a television series for Travel Channel. The show, which will run later this year, is about exploring different places through the crimes that shaped them. I'm not only writing, I'm hosting, so that I can get as close to the stories as possible. Basically, when we're talking about riots at which people were pepper-sprayed, imagination is only going to take me so far. To truly get it, I need to get a faceful of Mace. How was it, you ask? It hurt. But it definitely helped me understand. And my friends all think it's hilarious. They could watch that clip all day. JULIA: What's the latest book news? MARCUS: Tuesday, June 7th, the paperback of THE AMATEURS came out. I'm geeked about that--it's my first trade paperback, and it looks terrific. 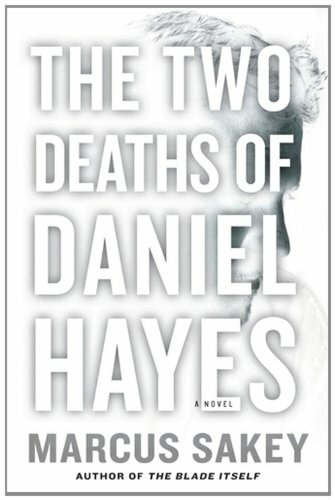 Then, two days later on June 9th, my new book, THE TWO DEATHS OF DANIEL HAYES, was released. JULIA: I'm going to mention Library Journal described The Two Deaths of Daniel Hayes as, “A possible threat to readers' cardiac health and a likely candidate for Hollywood interest.” Are you thinking along script lines as you write? MARCUS: I've had tremendous good fortune with Hollywood. Three of my novels have been sold to film, and they've gone to really talented people: Ben Affleck, Tobey Maguire, the producers of THE DEPARTED. I've been able to read screenplay versions of all them, and the scripts are great. It's an odd experience reading a script for a book you wrote; it's the only time you can read your own story and not know what's coming next. I've had people ask if I write the books imagining movies, and the answer is most definitely not. I'm a word guy, and while I want the book to feel real enough that you can see it, I'm not actually planning it around the idea of a film sale. JULIA: A couple of favorite classic movies? A couple of recent film favorites? Given your absolutely uncanny resemblance to a young Paul Michael Glaser, is Starsky and Hutch one of your favorite vintage TV shows? If not, what is? MARCUS: I AM Paul Michael Glaser. I know, you'd think I'd have aged more. What can I tell you? A balanced diet, sleep and exercise, and a steady infusion of beer. Favorite films, old and new. Well, an older film I'm a diehard fan of is NETWORK. What an incredible piece of work. The best satire I've ever seen. I like SPY GAME and TRUE ROMANCE and SIN CITY. I like OUT OF AFRICA and GARDEN STATE and OFFICE SPACE. I love good science fiction, especially on film. So here's a geek list: SERENITY, SUNSHINE, SOLARIS, MOON, THE FOUNTAIN. On TV I like THE WIRE and BATTLESTAR GALACTICA and THE WEST WING. If there's a trend, it's that I want to be swept up in story in a way that respects my intelligence. I'm not interested in avant garde film, nor do I like fat-guy-falls-down comedies. JULIA: Share with us one of your favorite book tour stories? 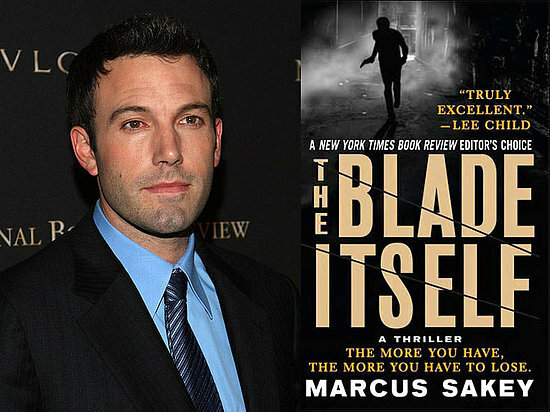 MARCUS: My first book, THE BLADE ITSELF, actually came out the same day as Sean Chercover's debut BIG CITY, BAD BLOOD. We barely knew each other at the time, but it seemed to make sense to go on tour together, especially since "go on tour" was a fancy way of saying "drive around on our own dime." Both books take place in Chicago, so our focus was on the Midwest. Sensible enough...except that it was February. We spent two weeks driving back and forth across Ohio in blizzards. Ended up in two car accidents. Rode seven hours for a signing where they had forgotten we were coming. Stayed in meth lab hotels and ate gas station dinners. By the end of the tour, I'm not sure we'd done much good for our books. But we had become great friends. We'd also started working together, and we still do. You can read excerpts of all Marcus Sakey's books at his website, as well as follow him on Twitter and friend him on Facebook. 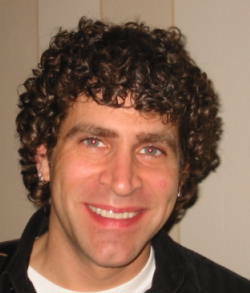 He also blogs with the always entertaining and informative The Outfit, a collective of Chicago crime fiction writers. I would love to see a motel actually call itself The Meth Lab Inn. Great interview! Marcus' website is a gem, BTW, especially if you are a new writer. His For Readers and Writers section gives practical and generous advice about writing and the business. And yeah, about the hair, LOL. Congrats on the new book, Marcus! Looking forward to reading it. BTW we're all members of the Lee Child fan club, too. He sets the bar high for generosity to his fellow human beings. OH,what a terrific interview! Marcus--your books are terrific, absolutely, and cinematic is just the right word. They also have heart and compassion, which is so difficult to pull off. Dennis Lehane says he's so used to being mixed up with the other authors who write about Boston and bank robbers that he just accepts the credit now--someone said to him, oh, I loved the movie The Town. Eve though Chuck Hogan wrote it--Lehane says he just says thanks. He figures someone will tell Hogan they loved Shutter Island. Anyway--so great to see you here. Applause applause from all of us at Jungle Red--we're HUGE fans! I definitely have to get my vote in on the great hair, Marcus, but you're much better looking than Paul Michael Glaser, even if you put him in a time warp . . .
And I can't wait to read your books--and see the movies--but books first. I love reading a really good book and then seeing what a good film production can do with it. I cut 20,000 words from my new ms. It made it MUCH better. It was kind of--exciting. I mean--they're not GONE gone. I'm just not using them right now.